Arlington Home Interiors is a full-service interior design studio based in Arlington Virginia that provides smart, functional living spaces for today’s modern families. Arlington Home Interiors serves Northern Virginia and the surrounding Washington DC metro area. In Arlington, many of the original homes are small Cape Cods and colonials. And while these charming homes may not have the same square footage as some of their new build neighbors, they offer wonderful reminders that there’s always an opportunity to make a big impact in a small space. Recently, one of our clients was looking to refresh the dining room in their newly purchased Cape Cod to make the space truly their own. 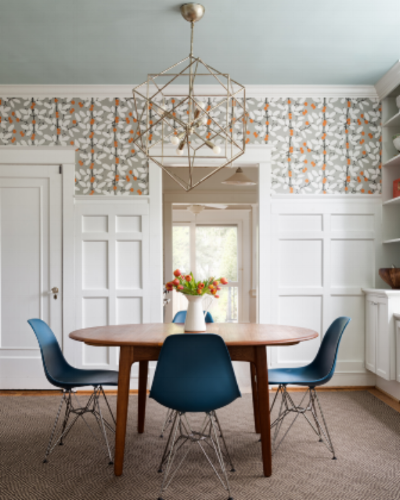 They wanted a kid-friendly space that reflected their love of color and mid-century leanings. So, we went with a happy, modern vibe. We started with an over-sized pendant for visual impact. Then, we added a beautiful patterned wallpaper above the millwork for character and painted the ceiling to draw the eye up. We included a custom-sized woven carpet in stain proof polypropylene to further enlarge the room. Our clients sourced a vintage Scandinavian table and paired it with plastic and metal Eiffel chairs for easy kid clean up. The back of the original china built-ins were painted with a complimentary teal color and styled with pops of orange and white to tie everything together. The end result was a visually enlarged space with fun and funky details to match our clients’ lifestyle and personality! And as an added bonus, Houzz recently featured this project in the 'Room of the Day' feature. AHI's Modern Mancave project was hand-picked by Houzz to be featured in the editorial ideabook; 'Trending Now: 10 Breakout Basements'. The article features 10 rooms where the space was designed around music. We were super excited to be included. This post started as a recommendation for the Matt Sesow exhibit at the Visionary Arts Museum (the best museum ever!! ), but once I got started, it was hard to stop so now I have a full overnight Design Date planned for you and your special someone. Baltimore is one of our favorite locations for a quick romantic trip. It was perfect when our kids were little and we didn’t want to leave them for long with my folks. Now we love it because it’s still charming and it reminds us of when we were younger (not that we’re old!). There’s no place like Baltimore. Lots to list, so I’ll keep it simple. During our visit, the highlights were The Big Hope Exhibit and DC Artist (and friend) Matt Sesow's solo show. This is a great museum to take the young artist in your life. Lots of eye candy from an over-sized floating pig to a giant head you can crawl inside to experience an amazing sound and light show (my son’s favorite). Be sure to save time for their one-of-a-kind gift shop! Self-described as a 'Boutique Dive Bar', Fork & Wrench has amazing farm to table food in rustic industrial meets flea market décor. Delish and great for Instagramming pics to your friends - and perfect for a romantic dinner, of course. If you plan to stay overnight, I recommend this beautifully designed boutique Inn, that is very serious about being earth friendly. Get a wonderful nights’ sleep in a fun part of town, and try something different from big chain hotels on the waterfront. And the weekend isn’t complete without browsing for a little something for your home to bring back. It's a great place for unique gifts. Lots of wood and mixed metal pieces. For even more design date ideas, be sure to join our mailing list to receive our high-content, no fluff monthly newsletter, “Stories From Home”, full of decorating tips and local deals and resources!